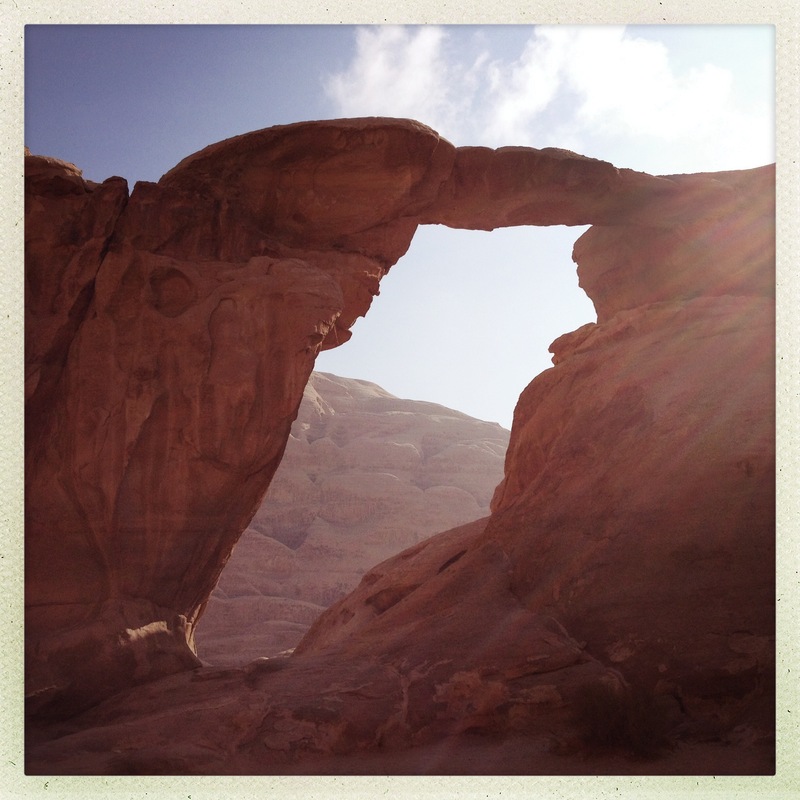 Jordan – Wadi Rum Tour then TO AQABA! Day six. An early start, a quick bite to eat, some more delicious tea (I am hooked on tea in the Middle East, I think it’s something to do with the two tonne of sugar that goes into it which I normally don’t have back home) and it was time to start our 4WD tour. We sat in the car for the first 10 mins but Omran wasn’t having any of it and ordered us out of the 4WD and climbed into the back and told to hold on to the cab of the 4WD whilst driving across the desert. This was the way it should be! I came to the realisation years ago that I’m not an ‘extreme sport’ type of girl (despite jumping out of a plane at 15,000 ft) so I found this form of travelling all very exhilarating. Our driver was simply to be our driver, not our guide, nor was Omran, so we just held on and took all the views in of the desert, imaging Lawrence of Arabia galloping across the wadi. For us Lawrence of Arabia was our main focus but I get the impression that the locals don’t care much for the legend. It’s impressive how our driver could navigate through the desert and we did get to stop at the Seven Pillars of Wisdom and TE Lawrence’s house. Both being spectacular views. We stopped at some rock formations and before I knew it Omran had coaxed Dad to climb this and they both stood on the arch. How funny that the tables were turned and all I could think was Mother saying she would never forgive me if anything happened to Dad. Our drive through the desert lasted three hours which flew by and before we knew it were back at camp and loading up Omran’s car for our next adventure. TO AQABA!!!!! 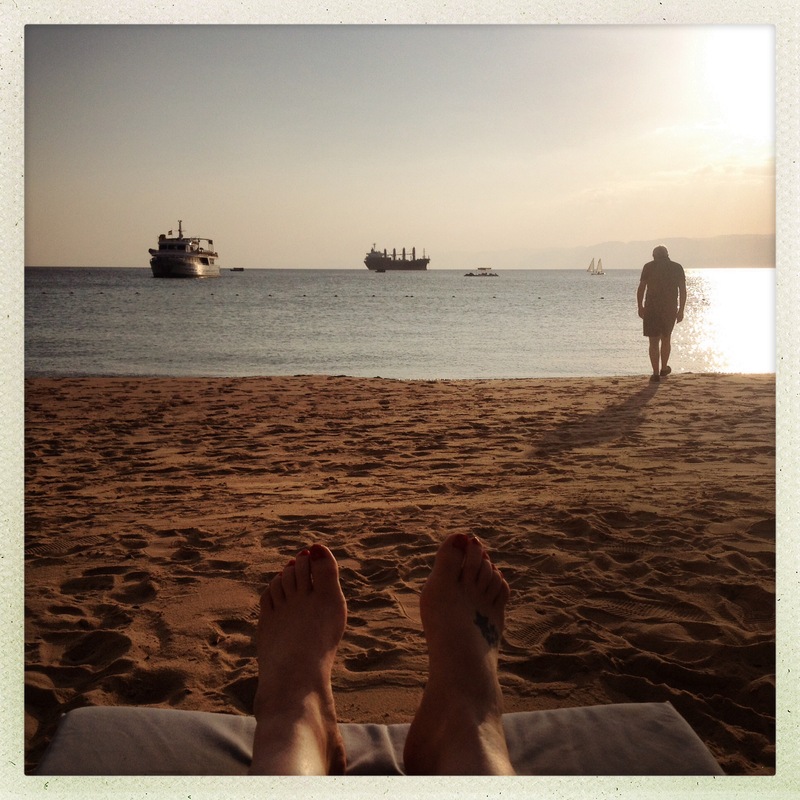 The next two nights – one in Aqaba and one at the Dead Sea – were to be our ‘relaxing’ days and the first time I have stayed at 5* resorts *EXCITED* Now don’t get me wrong I have done my time hostelling, the first six months of my last ‘big trip’ was spent in hostels. My most recent European trips, now I’m a bit older, we have chosen to stay at mid range hotels but now I get to stay 5*. Pretty much because I wouldn’t normally do a ‘resort’ holiday and 5* in this part of the world is cheaper than say NYC, London or Paris. Aqaba is situated alongside the Red Sea and Jordan’s only coastal city. It was declared as a Special Economic Zone back in 2000 so a lot of people come to Aqaba to do tax free shopping. Aqaba has a lot of high end resorts along the coastline but there is also a public beach if you are not staying at one of these. Wind surfing, scuba diving and glass bottom boat tours are popular. 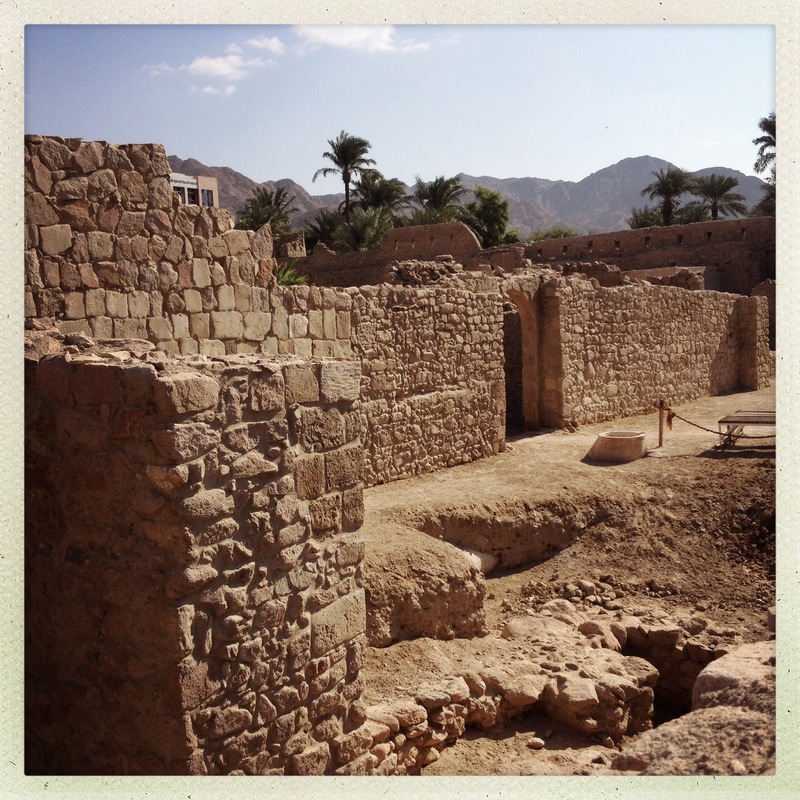 We were there to simply visit the fort made famous by the Battle of Aqaba led by TE Lawrence during WI and relax! Arriving in Aqaba it was immediately a lot warmer than the other places we have stayed and I was glad I remembered to take my thermal off before leaving the desert. From the minute we were greeted at the Kempinski hotel the service was flawless, even when we rocked up at this beautiful hotel wearing the same clothes we had slept in, covered in desert sand, still wearing our walking boots and I couldn’t take off my Indiana Jones hat as my hair was a greasy matted birds nest, the service was impeccable. I think I mentioned before about the airport scanners at the front entrance of some hotels? These are somewhat unnerving, some you are waved through, some seem a lot more thorough and even handbags are checked. Then there’s the old mirror on the end of the stick to check the bottom of vehicles but as I always say it’s better to have these checks than none at all. We were earlier than expected and two hours too early for check in. The very lovely receptionist took my phone number and said she would let us know if the room became available, probably taking pity on how terrible I looked, or didn’t want me to scare off the other guests haha. Despite feeling grotty from the night before we figured we could use this time to become familiar with Aqaba and then once we can check in we can relax by the sea or one of the many pool’s. So – to the fort!! It’s a pleasant walk along the corniche, past the public beach, a few people staring at the funny girl dressed in jeans, t-shirt, cardigan, walking boots and an Indiana Jones hat in 26c weather! I love the Jordanian hospitality though, walking past a young couple and the man greeted us with ‘Welcome to our Country, enjoy your stay’. Terribly nice! The fort was closed for repairs. Repairs?? It was (re)built in the 14 Century, surely it’s past repairs?? Whilst looking through the cast iron gates I tried the whole puppy dog eyes look at the security guard but he didn’t respond. This is the only bit of the fort I got to see, and that was by standing on a small wall surrounding it and holding my camera as high as I could pointing it in some sort of direction into the fort. We walked through the ‘souks’ of Aqaba and found them to be full of tacky seaside shops mainly full of products imported from China. It was quite bizarre. Maybe it was our tiredness but the town didn’t really have much appeal. 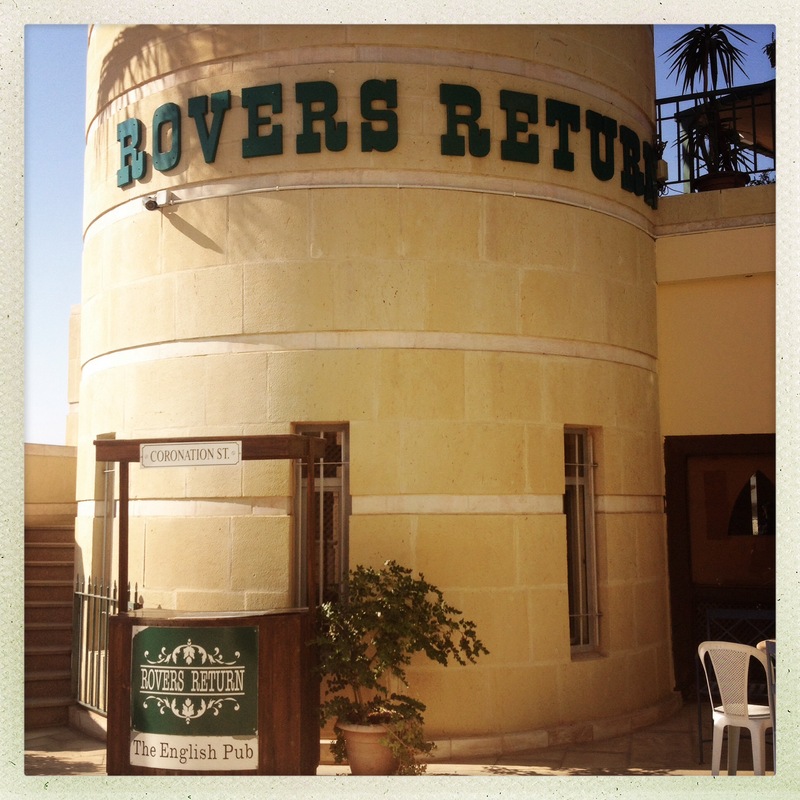 Yep, The Rovers Return. Full of Coronation Street memorabilia, beer and traditional pub grub. Something that you should really find on the Costa del Sol? I am ashamed to admit it but I don’t regret our decision. Sometimes you do just have to visit an Irish Bar (in Dubrovnik it was the cheapest place to eat), visit a McDonalds (I recommend the one by the Spanish Steps in Rome – it has a mini Trevi Fountain in it, oh and the one in Kuta, Bali when you recovering from 48 hours of Bali belly), and sometimes you just need to visit the Rovers Return. A pint, food that wasn’t falafel and houmous, and finally the phone rang to tell us we could check in. Woo! In the morning my view from the ‘bathroom’ was of a cliff face. In the evening it was my beautiful room and the Red Sea. You cannot get much different! Dinner at the hotel was spectacular, buffet style that we had come accustomed too. I still stuck to mostly Arabic delights with the hotel making me falafels on request haha. The service was impeccable also and the red wine and the three (miniature) desserts I had. ← Jordan – Petra, Little Petra, Wadi Araba, Wadi Rum. Day five.